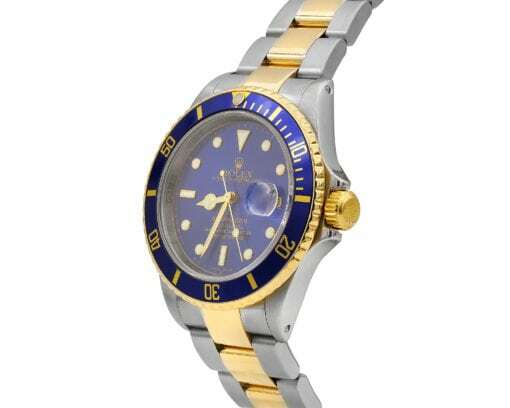 Men’s Rolex Oyster Perpetual SUBMARINER 40 mm in 18k Yellow Gold and Stainless Steel. Uni-directional rotatable Ceramic Blue bezel, Blue Dial with gold luminous hands, hour markers. The Date indicator is on 3 o’clock under the Cyclops Lens in Sapphire Chrystal. 18k Yellow Gold and Stainless Steel Oyster Bracelet with folding clasp. The watch has automatic self-winding caliber and water resistant up to 300 meters. The watch is in pristine condition.